See if you can fry an egg on the hood. If not, then you have disproved Global Warming ! "Earlier, when we arrived at Hoover Dam at sunrise, it took less than an hour for the sun to reach scorching intensity." ? I think the sun's intensity did not change. Only your perception of it. Same with many other things human. We believe our perceptions, rather than the realities. It makes rational decisions difficult. The answer to the energy crisis and the immigration answer may be the same. Lets not sell gas to illegals. We can probably save 5 million gallons a day. On the reverse side, if they cant get gas, they will all go back home! Thank you for your report from Hoover Dam; it was great. However, at that height, I would have been speechless. Good luck on your way to the Grand Canyon. The view from the skywalk will be absolutely breathtaking. There is so much beauty all around us; I would like to see the beauty of the rainforests with its inhabitants survive as well. Thanks for trying to search out answers to our energy crisis. Try and stay cool and drink plenty of fluids. God Bless you. Hi Cody, I left some tips on how to stay cool in a Scout on the "Desert Heat" blog comments.
" I think the sun’s intensity did not change" – Greater attenuation at horizon. Feeling warm, at noon, perception or real ?. "Lets not sell gas to illegals"
Lucky that aliens are picking fruit and doing the jobs US considers inhuman. The International Tapeworm favors US, aliens fleeing US imperialism effects. Good luck on your trip. I've been running a Diesel Scout for 21 years, and enjoy its reliable torque and smooth, steady power. 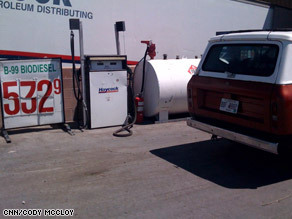 Since biodiesel has been available around here for the past few years, I have been buying it. I've thought of putting in some equipment to process Waste Vegetable Oil into a motor fuel, but there are health and property (safety) concerns. Be sure to keep plenty of fuel filters. A primary filter could be helpful too. If your temps creep up going through the desert or the Texas panhandle area, just slow down. Pushing for higher speed on a hot day causes excesive heat which the Scout can't dissipate if the ambient temp is too high. Again, good luck and happy Scouting. Might want to check on what ever fuel line you purcase as a replacement. Autozone sells bulk line pretty cheep but ask and make certain you wont have the same problem with it as the surgical tubing. With a 1978 disel motor I predict problems for you in the near future, unless it has been rebuilt recently with a conversion kit. Last I checked the seals and such in the engine were rubber back then so part of your problem might be those deteriorating rather than just the fuel hoses. Once you get the hoses and filter replaced you might check and see if puting in a bottle of STP Disel additive would help or not. Good source of information for you would be http://www.journeytoforever.com (I think thats the url) They had a similar trip back in 2003 when I was researching Biodisel. I needed to write down a brief notice in buy to thanks for all the fantastic suggestions you're placing at scitech.blogs.cnn.com. My prolonged internet lookup has at the finish of the day been recognized with reliable details and techniques to trade with my co-workers. I would assert that several of us readers really are seriously lucky to live in a important location with quite several excellent individuals with insightful pointers.